Bromo Tengger Semeru national park has a type of sub-montane, montane and sub-alphin ecosystems with large and hundreds years old of trees. Some plant species found in Bromo Tengger Semeru include jamuju (Dacrycarpus imbricatus), mountain pine (Casuarina sp. ), Eidelweis (Anaphalis javanica), various types orchids and rare species of grass (Styphelia pungieus). There are approximately 137 species of birds, 22 species of mammals and 4 species of reptile in this national park. Some protected and rare animals are also found in this national parks, some of them are mongoose (Pardofelis marmorata),deer (Cervus timorensis), long-tailed macaque (Macaca fascicularis), deer (Muntiacus muntjak), partridge red (Gallus gallus), leopard (Panthera pardus), ajag (Cuon alpinus), and various types of birds like alap-alap(Accipiter virgatus), hornbill (Buceros rhinoceros silvestris), snake eagles bido (Spilornis cheela bido), black thrush (Dicrurus macrocercus), Scaly-breasted falcon (Haliastur indus), and grouse that live in Ranu Pani, Ranu Regulo, and Ranu Kumbolo. Bromo Tengger Semeru National Park is the only conservation area in Indonesia that has uniqueness of the sand sea covering 5250 hectares, located at an altitude of ± 2100 feet from the sea level. There are 7 central eruptions found in the sand sea, in the two paths that criss-cross of east-west and northeast-southwest. From the northeast-southwest rise Mount Bromo an active volcano that still can erupt at any time, threaten human life around it. (± 3500 inhabitants). 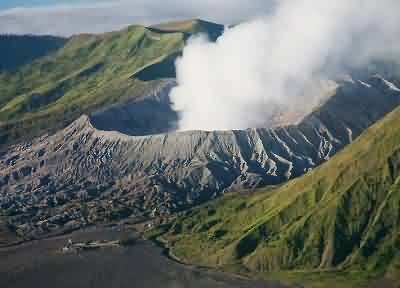 Mount Bromo has a crater with a diameter of ± 800 meters (north-south) and ± 600 meters(east-west). 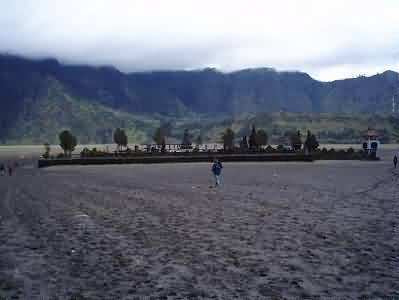 While the danger area is on a circle with a radius of 4 km from the center Bromo crater. Tenggerese(the local tribe) around the national park is a tribal Hindu. According legends, the origin of these tribes from the kingdom of Majapahit who lives in exile. Uniquely, the population seems to have no sense of fear despite knowing that Mount Bromo is dangerous, and that’s including many tourists who visit the National Park Bromo Tengger Semeru at the time of Kasodo ceremony. Kasodo ceremony is held every year at December/January at the full moon. 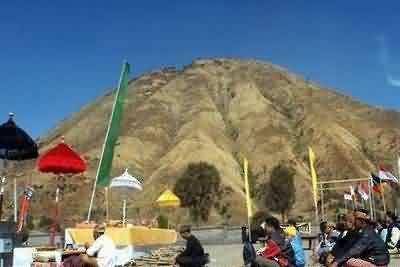 Through such ceremony, the Tenggerese begged for abundant harvest or asked for healing of various diseases, in particular by giving offerings with tossed into the crater of Mount Bromo,while the other Tengger people climb down the cliff to the crater to capture the thrown offerings, as a symbol of blessing from the Almighty.